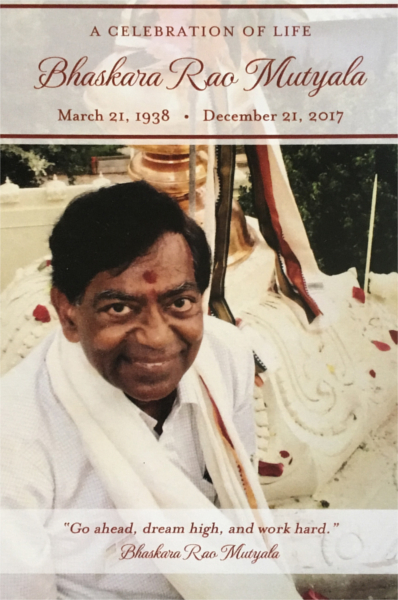 Bhaskara Rao Mutyala was born on March 21, 1938 in Kakinada, Andhra Pradesh, India. He hails from a family well known in the entire East Godavari District for their family values and involvement in community development. Bhaskara Rao graduated from College of Engineering, Kakinada (now called Jawaharlal Nehru Technology University) in 1961, worked as a lecturer in Andhra Polytechnic Institute and came to USA in 1962 to attend the University of Michigan. He received his Master’s degree in Mechanical Engineering from University of Michigan. He worked for the next 20 years as an engineering manager in various prestigious US corporations and institutions such as NASA. While working, he did M. B. A. in Management and taught at Indiana University on a part time basis. He then became an entrepreneur: a partner in an automobile transmission franchise system as well as running few service centers. After being very successful for about 25 years in these businesses which contributed to Houston economy, he retired in 2007. As they say in Telugu, “Inta gelichi rachchageluvu”, meaning that any “Service to Community should begin at home”, Bhaskara Rao’s service and meticulous discharge of his responsibilities began when his father passed away in 1956 while Bhaskara Rao was only 18 years old and became responsible for all five of his younger brothers aged 6 to 14 at that time. Immediately upon starting his US career in 1964, he brought all of his brothers to USA from 1965 to 1974. Bhaskara Rao married Sita, a young high school graduate from Rajahmundry, in 1967. Their marriage and their contribution to society individually and collectively is indeed “Made in Heaven”. Bhaskara Rao Mutyala was an unassuming ordinary Indian Gentleman. He was soft spoken, smiling, casual , cordial, humorous and friendly. A pleasant guy to hang around. Behind that ordinary look, he was an ambitious person, not for the money but for recognition. Recognition tagged with good qualities, dreams and success.